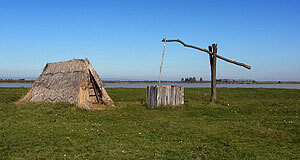 The small town of Mörbisch is situated by the Lake Neusiedler See just south of the town Rust. It is best known for its festival of operettas, which are performed on a floating stage on the lake and called "Mörbischer Seefestspiele". It makes a nice stop-over destination for people who travel towards the south of the Burgenland from the Seewinkel area. The area around Mörbisch has been populated for a long time: Neolithic tribes were the first to settle here something like 7,000 years ago. Later, the Romans moved here and used the nearby quarry of today′s St Margarethen. The first time that the modern name of the town appears in documents was in 1254, when it was referred to as "Possessio Megyes" - in which you can recognise the predominantly Hungarian population at that time. Like the rest of today′s Burgenland, Mörbisch was under Hungarian rule until 1921. Losing access to Hungary following the rise of communism there was particularly difficult for Mörbisch, which was economically dependent on the vicinity to Sopron until 1945. Once the town was "cut off" the city, it declined economically. Today, tourism and agriculture have helped to make Mörbisch a prosperous little place. In terms of sightseeing, you should check out the parish church and the "Hofgassen" or "Court Lanes". They are part of the UNESCO World Cultural Heritage site that combines parts of the Seewinkel. A small town museum is situated in the Heimathaus. Otherwise, the smoothening atmosphere of Mörbisch is usually enough to attract people. However, most Austrians associate the name of the town with the operetta festival that takes place here annually from mid-July to late August and attracts up to 220,000 visitors. The music focuses on Austrian composers of the "golden age of operetta" between the late 19th and early 20th century. The festival targets mostly old people who are both posh and stupid enough to enjoy operettas. Beyond that, Mörbisch tries to provide facilities for different kinds of sports. Its location by the lake helps a great deal with water sports: Sailing, windsurfing and swimming are popular among both locals and visitors. Cycling is, like anywhere around Lake Neusiedler See, a big deal. Walking in the surrounding hills (which are very, very gentle and rather unexciting) helps to get involved with the local wine without risking the loss of one′s drivers licence. Nearby attractions include the previously mentioned Rust; Eisenstadt; and the northern parts of the "Road of the Castles".